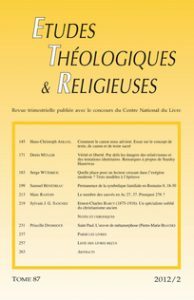 Nathalie SIFFER, Denis FRICKER, « Q » ou la source des paroles de Jésus, Paris, Cerf, coll. « Lire la Bible 162 », 2010. 21,5 cm. 215 p. ISBN 978-2-204-0388-1. € 20. Ryan T. JACKSON, New Creation in Paul’s Letters. A Study of the Historical and Social Setting of a Pauline Concept, Tübingen, Mohr Siebeck, coll. « Wunt II, 272 », 2010. 23,5 cm. xiv-232 p. ISBN 978-3-16-149999-9. € 59. Álvaro Pereira DELGADO, De apóstol a esclavo. El exemplum de Pablo en 1 Corintios 9, Rome, Gregorian and Biblical Press, coll. « Analecta Biblica 182 », 2010. 21 cm. 366 p. ISBN 978-88-7653-182-8. € 25,00. François VOUGA et Jean-François FAVRE, Pâques ou rien. La Résurrection au cœur du Nouveau Testament, Genève, Labor et Fides, coll. « Essais bibliques 45 », 2010. 22,5 cm. 374 p. ISBN 978-2-8309-1364-4. € 35/CHF 54. Bruce D. CHILTON, Darrell BOCK, Daniel M. GURTNER, Jacob NEUSNER, Lawrence H. SCHIFFMAN, Daniel ODEN, éd., A Comparative Handbook to the Gospel of Mark. Comparisons with Pseudepigrapha, the Qumran Scrolls, and Rabbinic Literature, Leiden, Brill, coll. « The New Testament Gospels in their Judaic Contexts 1 », 2010. 24,5 cm. xii-596 p. ISBN 978-90-04-17973-8. € 167/US$ 247. David INSTONE-BREWER, Prayer and Agriculture, Grand Rapids/Cambridge, UK, Eerdmans, coll. « Traditions of the Rabbis from the Era of the New Testament 1 », 2004. 24,5 cm. 456 p. ISBN 978-0-8028-4762-5. US$ 60. David INSTONE-BREWER, Feasts and Sabbath: Passover and Atonement, Grand Rapids/Cambridge, UK, Eerdmans, coll. « Traditions of the Rabbis from the Era of the New Testament 2A », 2011. 24,5 cm. 382 p. ISBN 978-0-8028-4763-8. US$ 60.